This entry was posted in Uncategorised on 29th July 2016 by geoffreyboot.org. 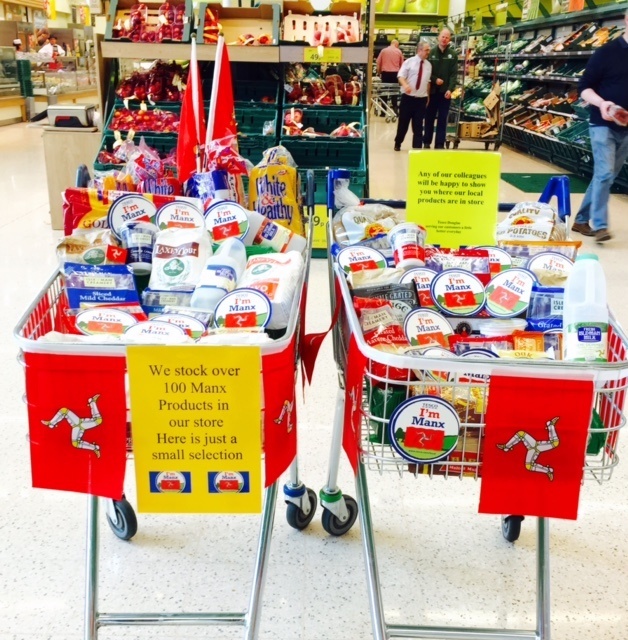 Someone told me that Tesco were promoting local Manx produce, something I have been keen on for a long time. I called in and sure enough there were two shopping trollies telling us they stock over 100 Manx products. 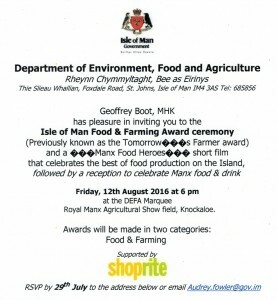 Don’t get me wrong this is a step in the right direction but when I looked in the baskets the reality is Isle of Man Creameries, Laxey Mills and Ramsey Bakery, consequently there are very few producers represented and 100 products come from the select few. We must get Manx meat back into Tesco’s and Brexit may give us some tools. At the moment 80% of the meat sold on island is imported and 80% of Manx meat is exported, typically at low value to our Meat Plant. Probably preaching to the converted but Shoprite are big supporters of local producers, particularly meat, and of course they are an Island based company. 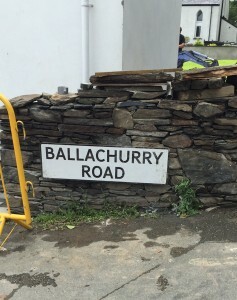 I was out in the Greeba area canvassing and I am pleased to say that at long last Ballachurry Road has a sign, something that we started when I was a Commissioners maybe 4 year ago. Full Department meeting at DED. We have no more formal meetings scheduled as all of the political members including me will be out canvassing. If any business needs to be transacted as Government goes on we will be called in. I was privileged to be able to host a function at Tynwald where the winners of the 2016 Energy Awards were announced. See press release below. The winners of the 2016 Energy Awards were announced this week with strong entries from a number of private sector companies and the public sector. 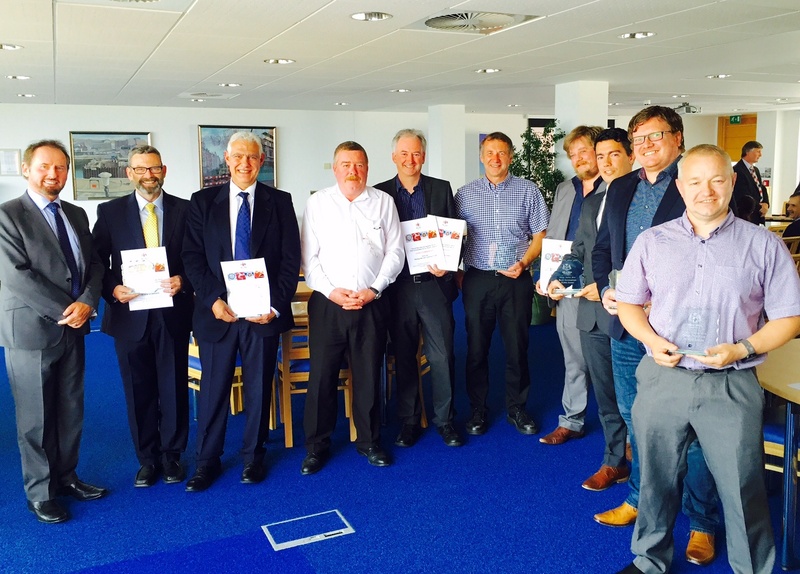 The awards recognise the achievements of local private and public sector organisations in making improvements to their energy efficiency and reducing their energy consumption and associated costs. Awards were presented for Best Innovation, Best Practice and Biggest Savings with public sector and private sector organisations each having their own category in respect of these. 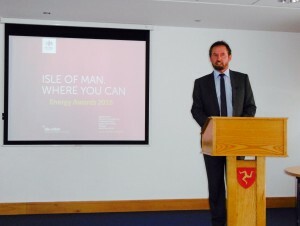 The organisation demonstrating Best Practice in the private sector was Bernhard Schulte Ship Management, Isle of Man, for implementing a wide variety of energy efficient solutions within their offices including installation of LED lighting. ‘I am a delighted to be chosen as a winner at this year’s awards. By changing the lighting in the office, we not only reduced our carbon foot print but we reduced our consumption of electricity by 23% in the first year – thus reducing our electricity bills by around the same percentage. The LED lighting also created a more productive work environment. The biggest saving award went to Rushen Eco Energy working with Matrix Energy Systems and Viessmann for their work at a Port Erin property, replacing existing oil heating systems with renewable technologies including ground source heat pumps and air source heat pumps. The improvements resulted in a monetary saving of £13,000 per annum for the owners. The award for Best Innovation was given to Complete Construction Services Ltd & SNX Ltd for The New Vickerage, a top level eco-home that integrates a very highly insulated traditional house with the best practice method of significantly reducing heat loss from the building envelope by reducing the Air Leakage. 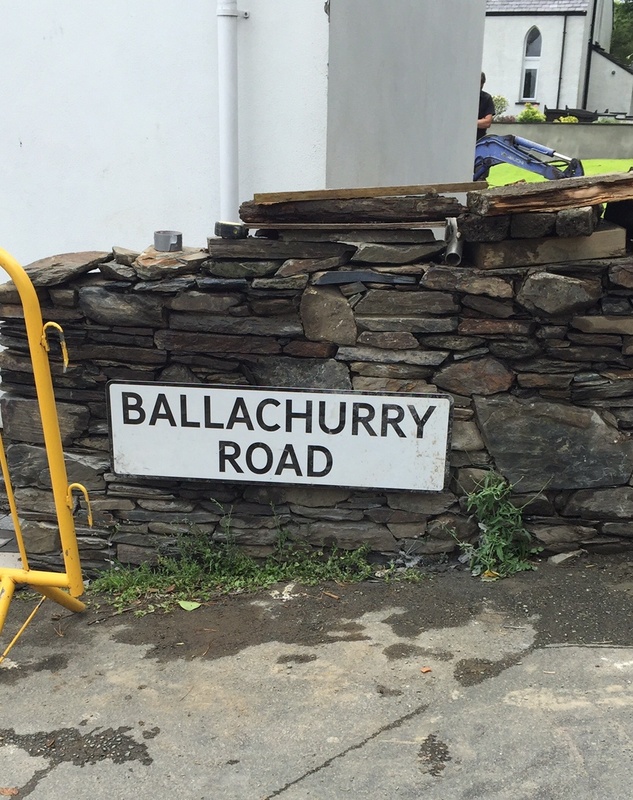 Among the Public Sector winners were the Department of Infrastructure for their recent work at Nobles Hospital, Douglas Borough Council for their project at Ballaughton Nurseries and Port Erin Commissioners for recent promotion of electric vehicles. This entry was posted in Uncategorised on 27th July 2016 by geoffreyboot.org. This entry was posted in Uncategorised on 26th July 2016 by geoffreyboot.org. This is good news as our conventional banking sector continues to contract, a new initiative. I have now produced a pre-election newsletter. This is not the manifesto, which will follow, but a taster of what has been going on behind the scenes etc. Started the day at DED, catch up meeting with my Officer support prior to the full Department meeting this coming week. Afternoon – went to the press launch of the new Silvery Gibbons facility. 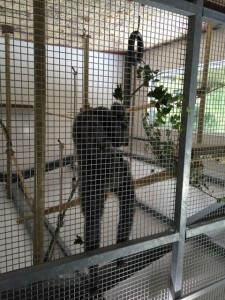 The Gibbons have recently arrived at the Curraghs Wildlife Park and seem to be settling in well. The park has been chosen to participate in a prestigious breeding programme. This entry was posted in Uncategorised on 25th July 2016 by geoffreyboot.org. A long three day Tynwald Court sitting, with much legislation and regulation passed as anything carried forward basically starts again with the newly elected Tynwald. There were some 49 items on the main order paper and we got through them all. A particularly contentious one was item 33 Road Transport Act 2001 which would have changed HGV regulation without the necessary standards manual being available. This was withdrawn and will be carried forward following representations from the Road Hauliers to the new administration. There were some 95 questions of which 73 were for oral answer two thirds were from Mr Karran. I suspect there was an element grandstanding by some of my fellow members as this was the last session of Tynwald before the election, as anticipated, the majority were converted to written replies when we ran out of time. Within the main order paper there were some significant items the Sea Services Agreement negotiations will continue with the Steam Packet but there was less enthusiasm for their offer than anticipated. The Douglas Bay Horse Trams will continue for at least another 2 years and there is a commitment to retain the track along the whole of the promenade. The review of the Functioning of Tynwald recommendations were passed and will be debated in more detail in the next Tynwald. There was progress in Planning Reform with the adoption of the High Level Strategic Review of Planning in the Isle of Man and adoption of recommendations as a result of a petition for redress. The Social Affairs Policy Review Committee Social Care Procurement recommendations have been adopted (I sat on this committee) and optimism was expressed for more local procurement as a result of Brexit. The future Manx State Pension proposals were adopted so that means that within the last parliamentary session we have at long last set in progress pension reform in both the State and Public Sectors. With my involvement with DEFA it was pleasing to see the Climate Change Mitigation Strategy, Sea Defences and Flooding, Costal Erosion Strategy, and the Landscape and Amenity for the Isle of Man Strategy passed. An amendment to the Fire Precautions Act 1975 will bring our fire precautions in houses of multiple occupancy and flats up to date. There were numerous other items, many of which were house keeping in terms of fee orders etc. All in all three long days but good progress. As it was the last sitting of the present parliamentary term it was time to say goodbye to four members who are definitely not re-standing; Eddie Teare Treasury Minister, John Shimmin Minister for Policy and Reform, Peter Karran (the end of an era) and Zac Hall who has only served one term and is returning to his career as an airline pilot. As for the rest of the members of the House of Keys we are all standing again so now it’s down to canvassing and a big push to get re-elected. I am amazed at how quickly the parliamentary session has passed, it only seems like yesterday that I was a new boy. I look forward to resuming business in the event that electors return me for the new parliament. This entry was posted in Uncategorised on 22nd July 2016 by geoffreyboot.org. Back at DED again for a meeting with senior management, a substantial business in the Isle of Man. A positive meeting and hopefully the business will now stay in the Isle of Man with a possibility of further growth for the near future. Greeted American friends at the welcome centre, they were cruising on the Azamara Quest. Spent the morning showing them the island with a pleasant lunch in Peel. 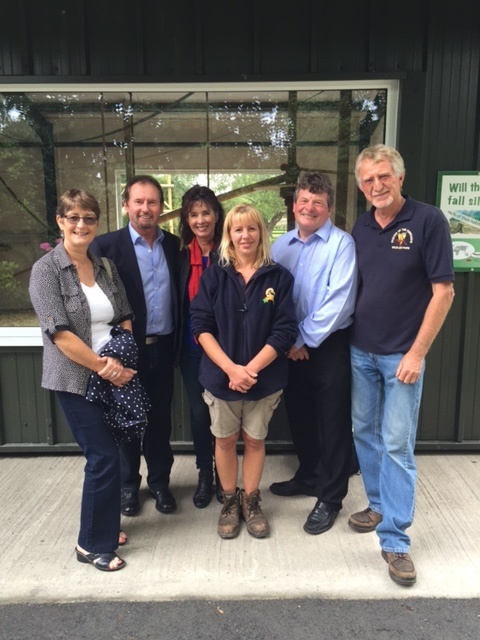 I then attended the Food Business Steering Group meeting at DEFA. Started canvassing. Coffee in Peel later. Suzie and I dipped our toes into the Peel Secret Gardens. Coffee at St James Church Dalby. Some interesting conversations with constituents. A further visit to Peel and it’s secret gardens, more was revealed and later in the afternoon to St. Pauls Church in Foxdale for their summer fair. Always amazed at the great voluntary work people do what a wonderful range of food at some of which formed our pudding later in the day. A morning meeting at DEFA with the Manx Wildlife Trust. Junior Tynwald Court, sadly I didn’t get there as I had a busy late morning with constituency work and preparing for tomorrows Tynwald sitting. This entry was posted in Uncategorised on 19th July 2016 by geoffreyboot.org.